Sindh Police’s ADIG Allegedly Showed His Power And Badmashi By Bothering A Couple At Night And It Is So Wrong! 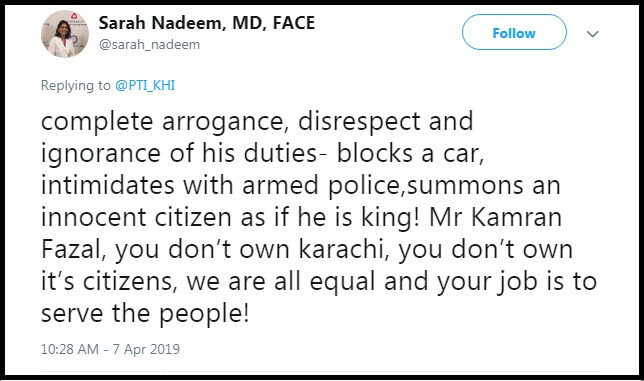 Everyone knows how the police department in Pakistan works. It is true that not all the police officers are the same but generally, the police department is considered as the most corrupt one. When we talk about Sindh police, there is a list of allegations the department is currently facing. Recently, the two-member bench of Sindh High Court comprising of Justice Naimatullah Phulpoto and Justice KK Agha criticized the performance of Sindh police during the hearing of missing person on 29th March 2019. Just after the SHC verdict on the missing person, another incident shows the lack of proficiency in Sindh police. A video is making rounds on social media where police officers were allegedly bothering a couple in a car at Defence Housing Authority Karachi. It can be seen in the video that a car was stopped by a white double-cabin SUV and police officers kept asking them to step out and meet the ‘sir’. 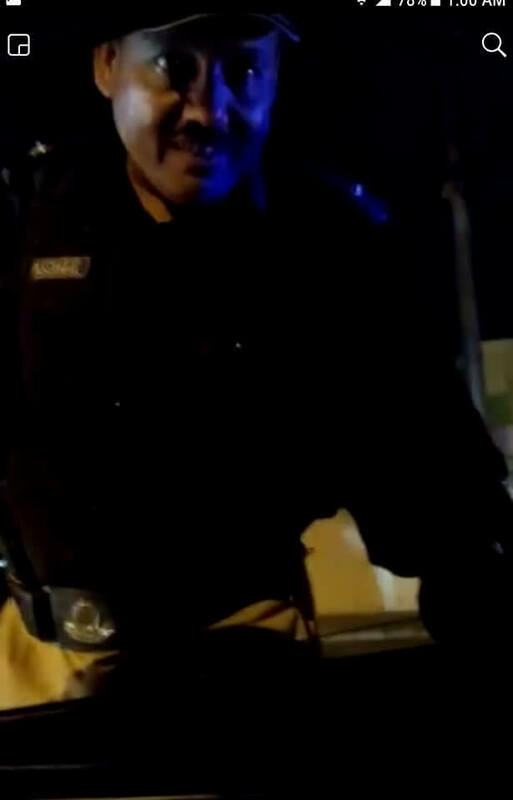 The video was recorded by a woman sitting in the car while engaging the officers in the conversation. It can be heard clearly in the video that the police officers were asking the two people sitting in the car to ‘come and meet sir’ who is in the white double-cabin. While the two people sitting in the car say that they would not do so since they were ordinary citizens and that the ‘sir’ could come and meet them instead. The man in the car clarifies to the police officers that they had done nothing wrong and couldn’t figure out why a police car has blocked their way in the middle of the road. On the other hand, the woman was continuously asking the police officers about the name of their ‘sir’, who was not bothering to come out of his car. To this question, one of the police officers said that the additional deputy inspector-general (ADIG) is in the car. Kamran Fazal, ADIG CTD Sindh police refuted the statements by the people sitting in the car. According to Geo News, Kamran Fazal said that he was traveling with his family and it was the car that had overtaken them and a couple of motorcycles, twice. The driver of that car was driving recklessly and his officers stopped the car to ask what the driver’s problem was. Kamran told that the incident had taken place some four or five days ago and they admitted their mistake and apologized afterward. ADIG Sindh said that he couldn’t come out of his vehicle due to security reasons. Watch The Complete Video Here! However, Social Media Users Aren’t Happy With AIG’s Provided Justification! 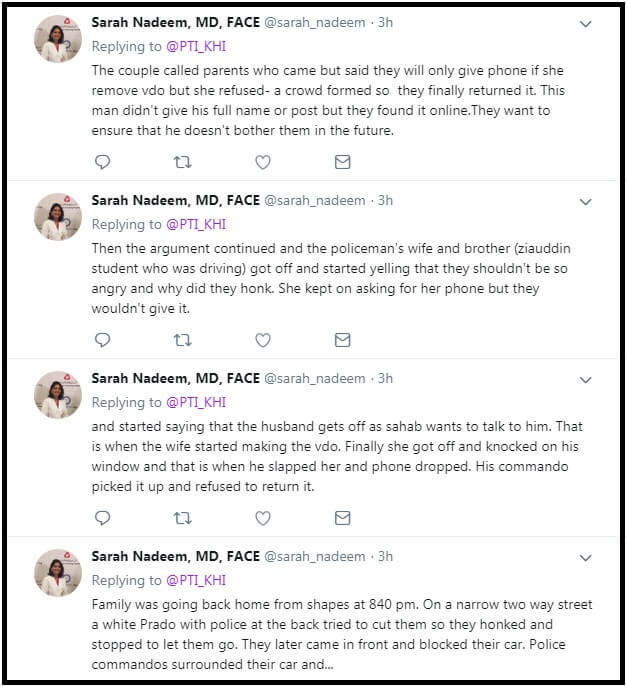 A Social Media User Shared The Complete Details Of The Incident! Let’s see if the Sindh government takes notice of this incident and defends or criticize ADIG on his behavior with citizens.